When it comes to coffee, in particular to specialty coffee, the tool most commonly used is called the Coffee Taster’s Flavor Wheel. With it, users can first roughly categorize their coffee according to its taste and flavors, then proceed to define these on an increasingly differentiated scale. The wheel was developed by the Specialty Coffee Association of America (SCAA), which was founded in 1982 by a small group of coffee experts. The items on the flavor wheel are not grabbed out of thin air or wishful thinking. They have documented flavors that can be identified by coffee professionals and sensory scientists, made accessible to readers. Brew some fresh coffee: Prepare the coffee carefully, observing the coffee at different stages: the fragrance just after grinding, the aromas which escape the moment water hits the coffee grounds, and the flavors that fill the palate when the coffee is sipped. ‘Flavor’ is defined as a combination of taste and smell, and the flavor wheel contains attributes on the entire continuum between basic tastes (those things perceived only by the tongue) to pure aromatics (those things that only can be smelled). Start at the Center: The wheel’s design encourages the taster to start at the center, and work outward. The most general taste descriptors are near the center, and they get more specific as the tiers work outward. The taster can stop anywhere along the way, but the farther outward the taster works, the more specific the description might be. Read the Lexicon: The wheel is based on the World Coffee Research Sensory Lexicon, a standard set of attributes designed to allow trained sensory panels evaluate coffees for scientific research purposes. Each attribute has a definition and a ‘reference’, which can be used to calibrate tasters who may seek clarification on specific attributes. Start at the Center Again: With a knowledge of the Lexicon Attributes in mind taste a coffee and start in the center again, working your way out to a specific attribute. You may notice the attribute ‘cells’ appear to be a different distance from one another. If two attribute cells are connected, it means that the professional tasters thought of these attributes as being closely related, and if there is a gap, that means the tasters thought of them as being slightly less closely related. This might be helpful when ‘calibrating’ coffee descriptors to other tasters’ experiences, or designing taste descriptors that are intelligible to the maximum number of people. Study the Colors: Our visual sense is strongly connected with our other senses, and the way foods look give us important cues to how they are likely to taste. For this reason, we often use visual terms to describe flavor: a coffee can taste “bright” or “red” or “green”. With this awareness, pay special attention to the colors on the wheel, trying hard to link the terms with colors that represent the attribute clearly. This might help a struggling taster find a descriptor: if they can only articulate “it tastes like a red fruit of some kind”, the taster can scan the red-colored attributes on the wheel. “Something brown” might send the taster to the left side of the wheel, where the brown territory is, perhaps stimulating the awareness of spice or grain notes. 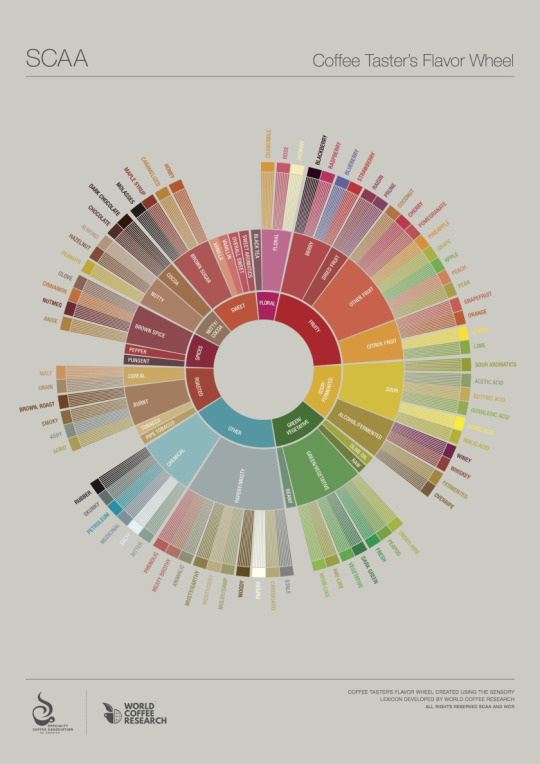 The most important thing to do to understand and utilize the wheel is to taste a lot of coffees. Whether it’s your morning brew or a special visit to the coffee shop, give the flavors and aromas of that coffee a moment of thought. Before long, you’ll be a natural at tasting coffee and understanding its flavor components.